OFW Movie LAWAS KAN PINABLI screening at the Cinema is Incomplete on March 16,2012 Friday at 8pm. Cinema Is Incomplete is located at 117-C Anonas Extension, Sikatuna Village, Q.C. Please contact 0906 220 8124 and 0917 486 2623 for details. 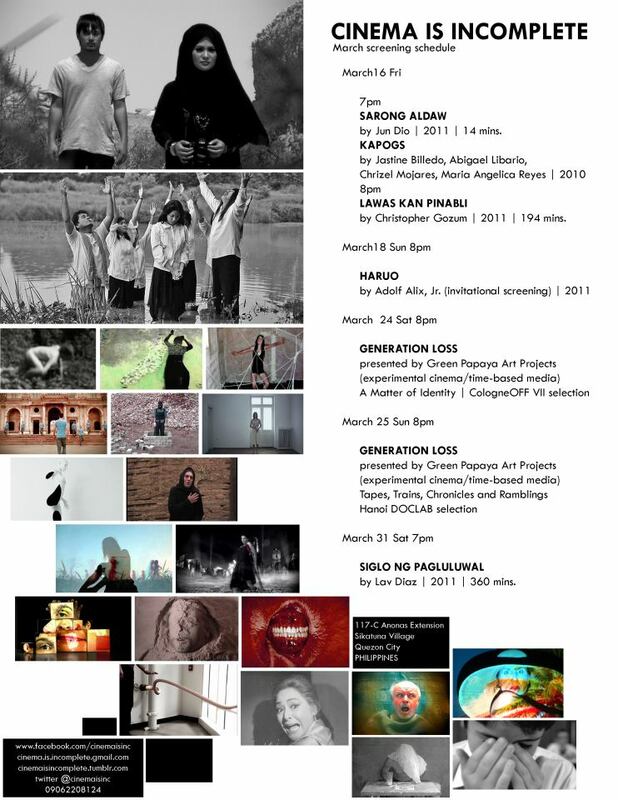 Combining fiction and documentary specifically interviews of eight Filipino migrant workers along with voice-over narration of various texts translated in the Pangasinan language – selected passages from the Holy Bible, selected poetry about exile, and selected lines from classical noh plays, the film creates an intimate portrait of the Filipino diaspora in the Middle East. The film’s title Lawas Kan Pinabli is based from a popular folk love song in the Pangasinan province with the same title.